The Holiday Inn - Astrodome is one of the cleanist hotels I've stayed in. The staff was very friendly and helpful. The driver (for the shuttle) was so polite and nice. Hats off to the management and all of the staff. They are doing a great job. This was a great place to stay and I hope I can get it again as it was convenient for me. It was convenient to MD Anderson and it had plenty of free parking. It was a little noisy on our floor at first, but then the young men settled down. This hotel met all our needs. 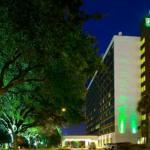 The pet-friendly Holiday Inn Astrodome comprises 238 quality rooms equally suited to the business traveler or families on vacation. Items included with the room rate at this 11-story hotel are high-speed Internet access, local telephone calls, in-room coffee, a morning newspaper and parking. There are four rooms available for business or social functions. The largest can accommodate 450 guests. Area landmarks and attractions include Reliant Park, the Houston museum district, the Texas Medical Center, M D Anderson Cancer Center, the University of Texas, downtown Houstons theatre district, shopping and entertainment at the Galleria Mall, the Houston Zoo, Sam Houston Race Park and the Space Center Houston. All the guestrooms and eight suites have a work desk with high-speed Internet access, Internet browser television with cable movie and news channels, pay-per-view movies, coffeemaker, refrigerator, iron and ironing board, hairdryer and two dual-line telephones with voicemail. Connecting rooms and rollaway beds are available. This hotel has an outdoor swimming pool, whirlpool and a fitness center that is open from 6am until 10pm. The on-site Bayou Grill is open for breakfast and dinner and the Sports Page lounge is open throughout the day with a fully stocked bar and lighter fare. Room service is available from 6am until 10pm. There are two restaurants across the street from the hotel  an Olive Garden and Marcos restaurant. The 24-hour front desk has safe deposit boxes and information on area events and attractions. Other amenities include a business center, guest laundry, same-day dry cleaning service and ice and vending machines. This is an older hotel but it is well maintained and managed and still attracts a lot of repeat customers. Thats what several guests had to say about their stay at this Holiday Inn. The location is ideal for the new Reliant Stadium and no distance from other Houston attractions. The team of helpful and efficient employees is appreciated for its hard work and the rates here are reasonable. Other plus points are clean and comfortable rooms, reasonably priced dining and a pleasant outdoor swimming pool.